Mary Wollstonecraft Shelley (1797-1851)- Shelley's 2nd wife, author of Frankenstein etc. The life of Percy Bysshe Shelley Vol.2 (link to google books) by Jefferson Hogg, pub. 1858 (in 4 volumes but only 2 finished). This is a much critcised biography, more about Hogg than Shelley- see Salt's 'examination' of it below. Shelley - from The Ethics of Diet by Howard Williams M.A., 1883. A Vindication of Natural Diet (original 1813) (link to archive.org) - new edition from 1884, with a preface by Henry S. Salt and W.E.A. Axon. Inaugural address, by the Rev. S. A. Brooke. On the vicissitudes of Queen Mab, by H. Buxton Forman. Shelley's view of nature contrasted with Darwin's, by Mathilde Blind. A study of Prometheus unbound, by W. M. Rossetti, pt. I. Note on The triumph of life, by John Todhunter. Shelley, Peterloo and the Mask of anarchy, by H. Buxton Forman. The hermit of Marlow, by H. Buxton Forman. Shelley and Lord Beaconsfield, by Dr. Richard Garnett. A study of Prometheus unbound, by W. M. Rossetti, pt. II-III. Appendix: The Shelley society's first and second annual reports, by W. M. Rossetti. Shelley and socialism, by Edward Aveling and Eleanor M. Aveling, pt. 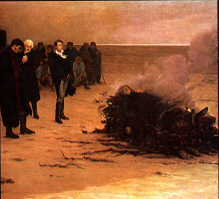 I.
Shelley's faith, by Kineton Parkes. Shelley's metre, by Rev. J. B. Mayor. Shelley's philosophy of love, by Arthur Dillon. Shelley's nature poetry, by Henry Sweet. A study of Shelley's Julian and Maddalo, by H. S. Salt. Note on the "Identification of The Aziola of Shelley," by H. T. Wharton. Rosalind and Helen, by H. Buxton Forman. Shelley and the marriage question, by John Todhunter.